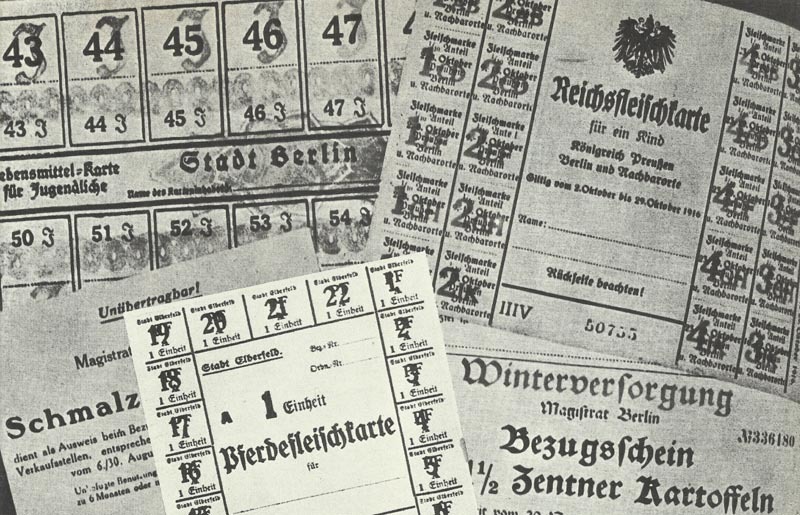 German food ration coupons for the people. Battle of the Somme: British capture trench northwest of Bazentin. German counter-attack held northwest of Pozieres. Verdun­: French Moroccan Colonial Regiment secure Fleury and Thiaumont (­August 18) for good, repel German attacks (August 19 and 27-28). Italian Front: At 1800 Cadorna suspends most successful Isonzo offensive yet after 3-4 mile gains on 15­-mile front for 51,232 casualties (12,128 missing) vs 49,035 Austrian (20,000 PoWs) and 30 guns. Macedonia – Pre-emptive Bulgar offensive into Greece (until August 28): 2 Bulgar columns attack Serb Danube Division near Florina and capture station, deploy 18,000 men (until August 19) to drive back Serb Third Army at West end of Allied line while Bulgar Second Army at east end begins advance to Struma. Rumania: Government agrees to join the Allies, signs military conven­tion to enter war by August 28. USA: JP Morgan Bank announces $250 million two-year loan to Russia. Greece­: German and Bulgar notes to justify seizing Greek territory.